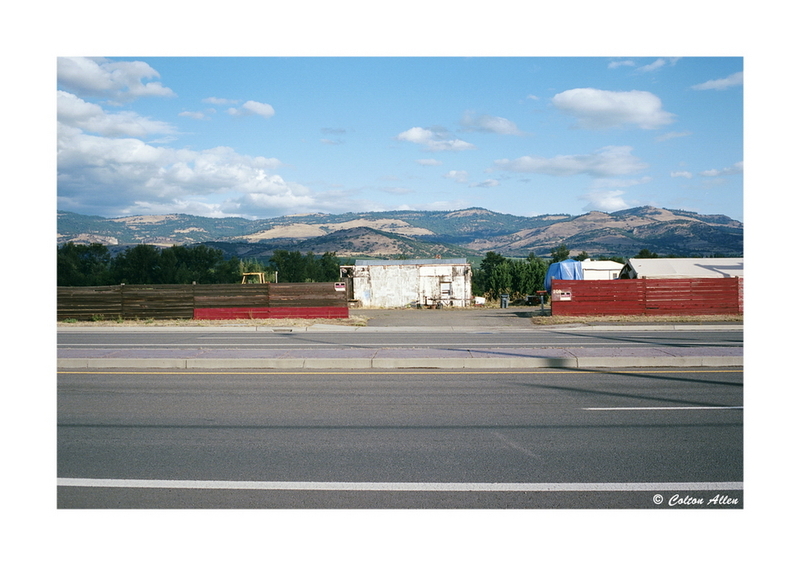 Getting the most from color negative film with your Epson flatbed. You may or may not have read my previous article on scanning color negative film, but since originally writing it, I’ve learned a lot more about it, and I’ve changed my method somewhat. There are a few things I should mention before getting into the technical stuff though. Firstly, this article primarily pertains to C-41 color negative film, and to a lesser extent, C-41 B&W film. Most of this will help with true B&W as well as E-6 slide film, but those films have certain characteristics which may make this method not work well. Secondly, it is not my intent to claim that this is the best way. It’s also not the easiest method. I also understand that there better scanners available, and also that doing a 16bit linear scan and inverting in Ps can theoretically give better results. I primarily use Epson Scan to create a positive image from the negative, and so that is what this article is about. Thirdly, I am not a trained professional in the field of scanning and digital imaging. For that reason, I will be the first to say that I may be wrong or misinformed on some of the technical aspects of film characteristics and digital imaging. This article is written based on things “as I currently understand them”. A bit about digital imaging and color film (as I understand them) before we get going. I think it’s very important to understand digital imaging, and the way color film works, especially if you want to get the most from your film. I know that many people choose to shoot film for the very reason that they don’t want to deal with digital imaging, which is fine as long as your happy with your lab scans or prints. Color negative film, in a basic sense, is simply three separate layers, each of which records only red, green, or blue light. Once the layers are inverted (and the orange base accounted for) you end up with a full color image. A digital image is essentially the same concept in digital form. A digital color image is made up of a grid of pixels, each pixel being made of three color channels, red, green, and blue. Each pixel is given a value (0-255) for each channel. 0 being darkest, 255 being the brightest. A pixel value of 0, 0, 0 would be the darkest black, and 255, 255, 255 would be the brightest white. 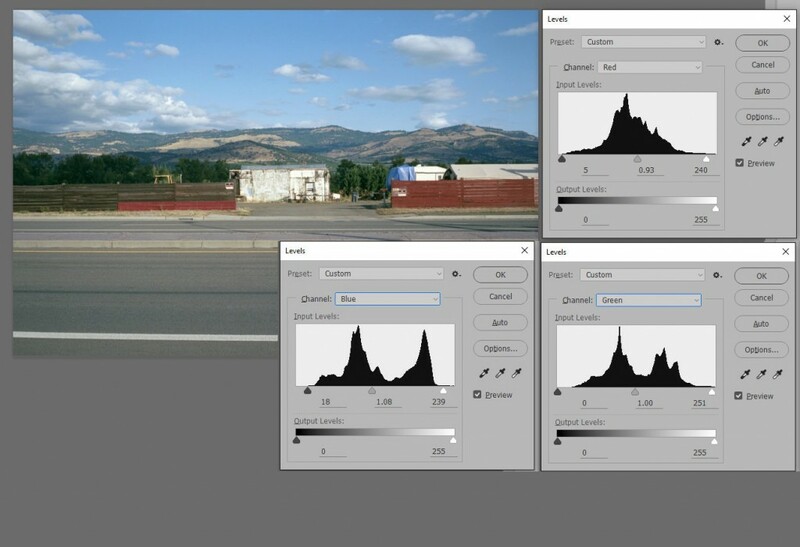 The image histogram is a sort of map that shows the breakdown of pixels and their values throughout the image, so it’s very important to understand what the histogram is telling you. Here’s a great article on understanding image histograms histograms http://www.marginalsoftware.com/HowtoScan/image_histograms.htm. 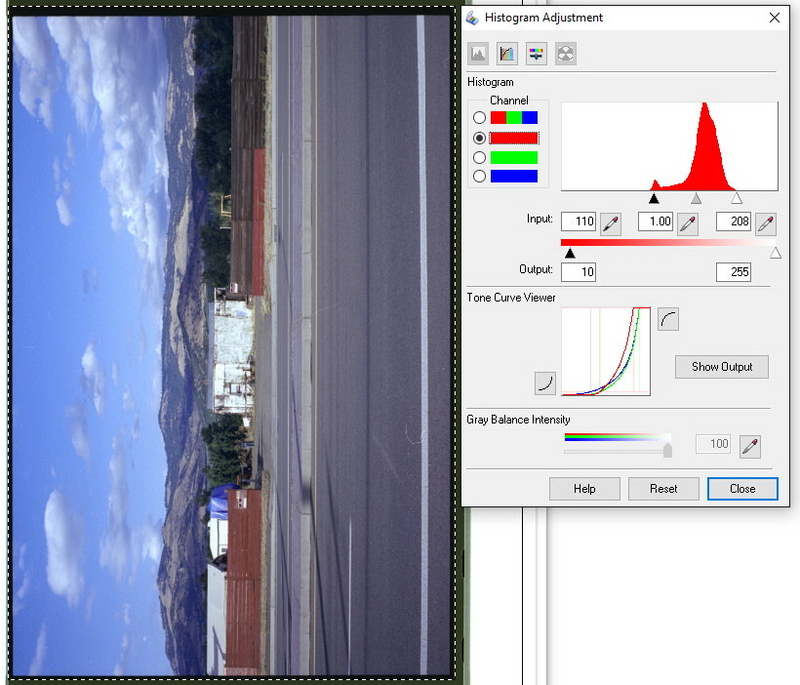 Most basic histograms are only showing greyscale or luminosity values though, so it’s very important to look at the histograms for each individual color channel. 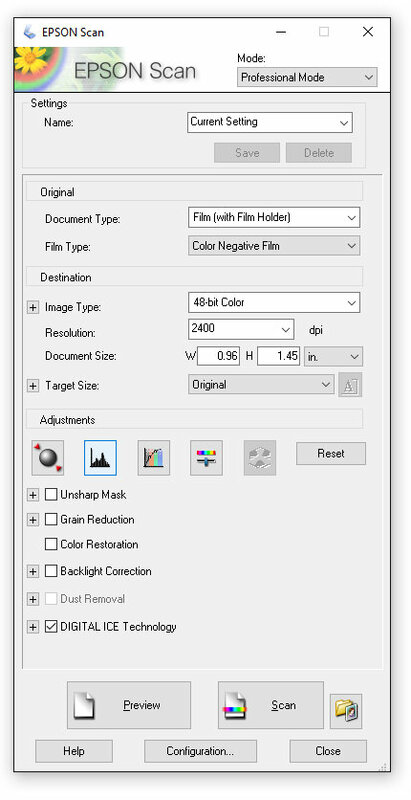 The trick with scanning, is to get the scanner and software to output the maximum range of tones in each color channel, without clipping tones at either end of the histogram. Since writing my previous article on scanning, I have changed my method somewhat, and I thought it was worth sharing. I’m in Professional Mode, Color Negative Film, 48-bit Color, 2400dpi, and Target Size is set to Original. Everything is unchecked except Digital ICE. Using ICE is a matter of preference. I use it because I don’t think it affects IQ that much and it greatly reduces the amount of dust/spot removal in Ps. I typically scan most of my film at 24 bit color and save as jpeg, and then if it warrants it I’ll scan select images at 48bit and save as a tiff file. 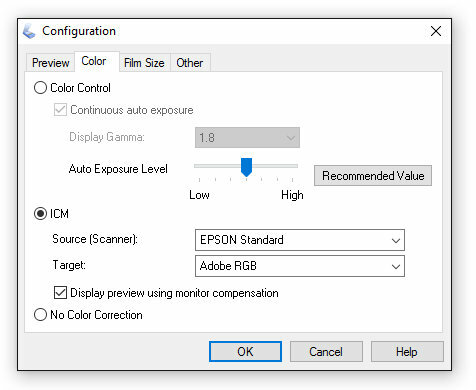 If you are scanning at 48 bit, make sure Epson Scan is set to save as tiff. Here’s how I have Configuration set up. I have it set to ICM, with Source set to Epson Standard and Target set to Adobe RGB. If you don’t have Adobe RGB as a choice, you need to download the profile from Adobe and install it. With film loaded in the scanner, run a preview scan (make sure Thumbnail is unchecked), cut a marquee over the frame you want to scan, and then zoom in on that marquee/frame. Once it is zoomed in, adjust the marquee edges so that some of the black edge (unexposed film border) is inside the frame, but none of the white area beyond is inside. 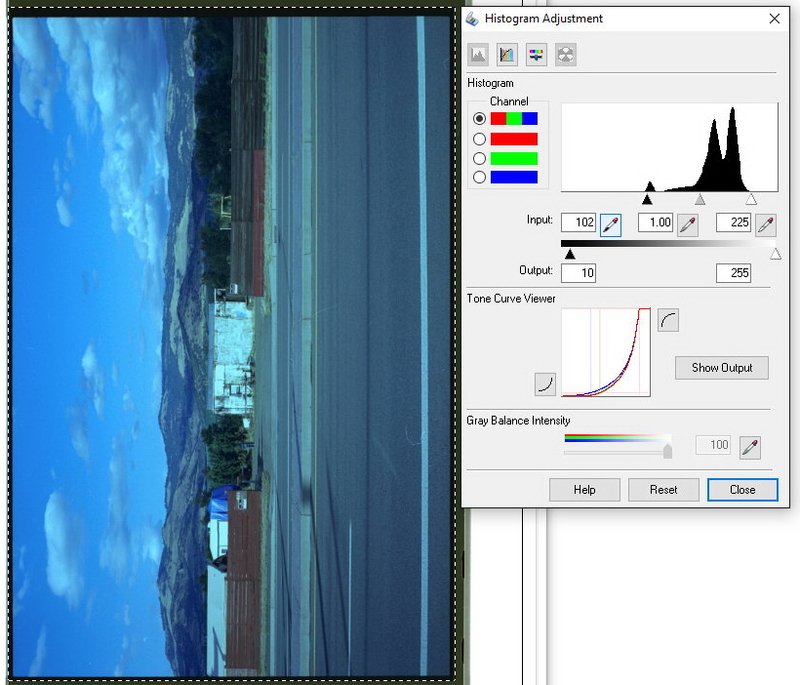 After adjusting the marquee, open the Histogram Adjustment dialog. It should look like the image below now. 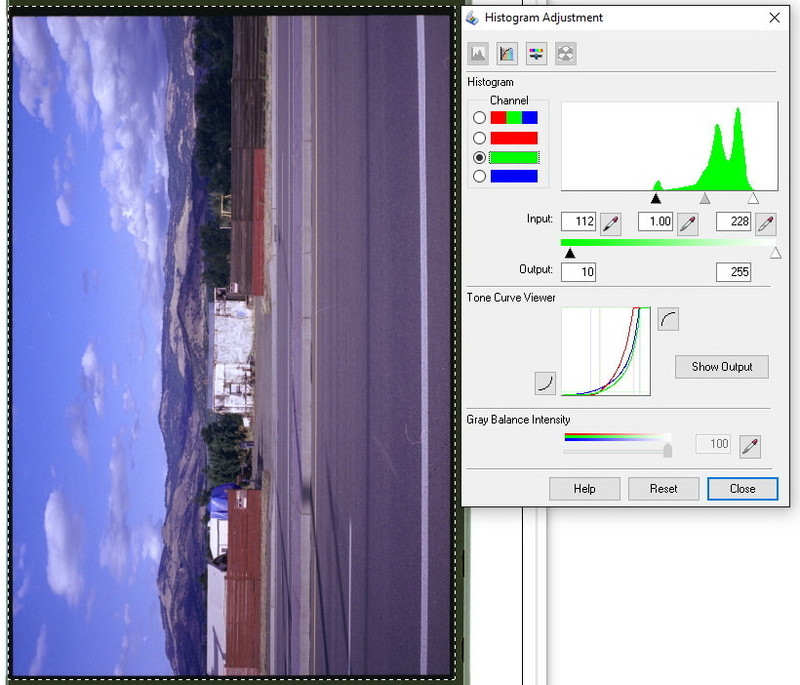 If the settings in the Histogram dialog look different, then click the reset button at the bottom. For those interested, the particular negative I’m using is Kodak Ektar 35mm, and was made using my Contax G2 and Zeiss Planar 32/2. Then I go to the Red Channel, and set the brightpoint triangle to the very edge of the right side of the red histogram. Now comes the tricky part, and needs be done visually. The above preview scan has (to my eye) a Red cast. To deal with it, I go back to the Red Channel and remove some Red by changing the Red midpoint from 1.00 to 0.88. Moving the midpoint slider to the left adds that color (whichever color channel you’re working with) and moving it to the right removes that color. If your image has a Blue cast, then move the Blue midpoint to the right, and for a Green cast, move the Green midpoint to the right. Cyan, Magenta, and Yellow, are opposites of Red, Green, and Blue. For a Cyan cast, add Red. For a Magenta cast, add Green. For a Yellow cast add Blue. This has more to do with the relationship of the 3 channels to each other, and not really the actual number values of the three points. Another way of looking at it is, if you have a Magenta cast, you can add Green, or you can remove both Red and Blue. If you have something grey in the frame, you can use the combined RGB midpoint eyedropper tool to get your overall balance close, but I usually find that I need to fine tune the individual channel midpoints to get it closer to my eye. I have found that it is easy to clip the shadows in Epson Scan if you start moving the the darkpoint sliders. I like to use the film base as a good start point for black balance, and then adjust from there in Ps. With Kodak Ektar, the Blue Channel almost always has a rather large separation from where the darkpoint is on the unexposed film and where the left side of the histogram starts. This is why Ektar can very easily have a blue cast in the shadows. This is probably part of how Ektar was designed. When scanning other films, I’ve noticed that (because of the orange mask?) you can often end up with the Blue Channel clipped in the shadows to begin with, and you can’t do anything about it. If you look at the image of the Photoshop Levels, you’ll see that I moved the Blue darkpoint up a bit. 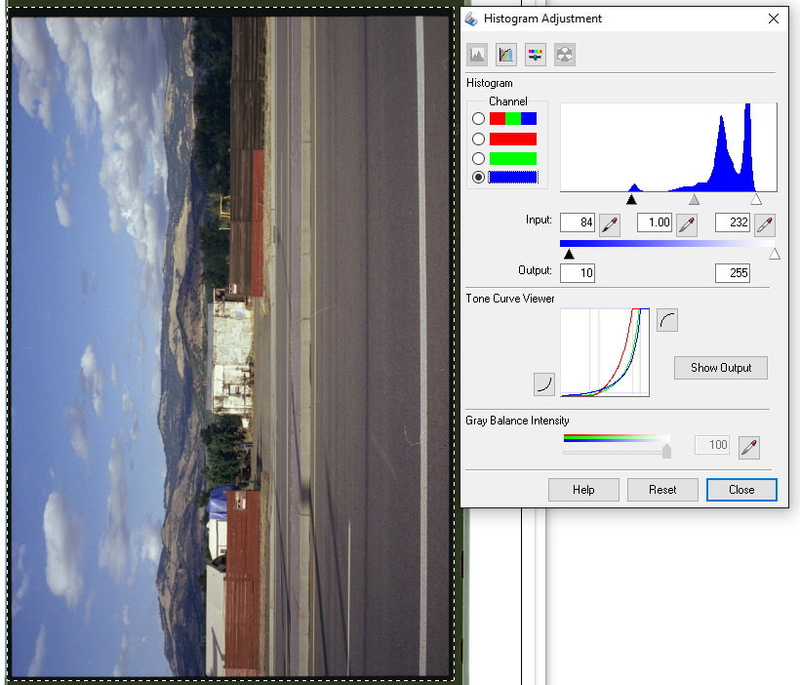 Depending on the image and exposure, you may not necessarily want the darkpoint sliders set right to the left edge of the histogram. That’s personal preference though. Thanks for reading, and I hope this helps. Nice and valuable write-up. Thanks from one Pentaxian to another. Thank you very much for sharing your knowledge, Colton ! I will try this one out, though I was very happy with your first scanning advice. BTW – your photographic work is always a source of inspiration and a great pleasure to look at. Colton, Jan from Flickr here. Mind if I put a link to your write up at the “Film’s Dead …” pool? I think it’s a great piece. If it’s okay email me because I don’t see a check off for replies to comments. Thanks! The colors look way more saturated in the last photo. Is there another step missing? Cheers. It might be a embedded color profile issue. The very last image is the actual AdobeRGB profiled scan, but all the previous images are from screenshots.